For NADA New York 2017, yours mine & ours co-curated a booth with Jeremy Couillard. Our booth coincides with a solo exhibition of Couillard’s at the gallery featuring the video game Alien Afterlife. Highlighted at the gallery and our booth is a kinetic alien chatting on a laptop via Google Hangout with another alien at yours mine & ours. Ever since the creation of Ezra Chabot, the first Artificial Intelligence software, and digital psychologist, we have anxiously been inputting our personalities into machines and getting an incomplete and fragmented digital version outputted back. “If you like this you’ll love that.” culminating in a Facebook news feed of comments from a curated group of acquaintances, or Netflix or Artsy or Amazon telling you what you’ll like based on other likes. These loops produce the opposite of what art does…or can do. An empire of computers, thousands of data centers the size of stadiums, opaquely hidden away in ex-urban nowheres built to pander to us. 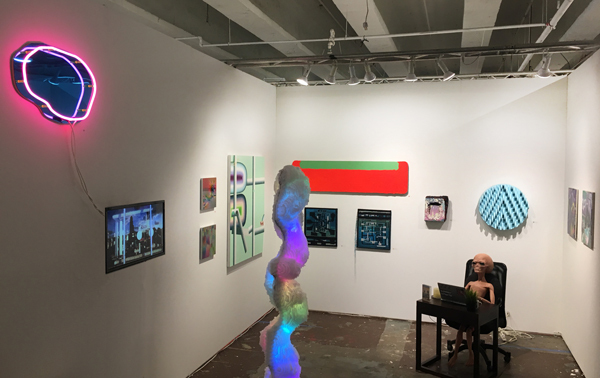 Our booth includes artists that use computer space as a tool to break the expected output of the omnipresent regurgitating algorithms. The chaotic dirt and grime of everyday life that seems escapable in the clean, organized digital world, is recreated in a safe, simulated environment. Alongside the artists implementing the system to generate work, we also have those that are pushing against the clean output of the digital age by turning back to traditional methods in their practices.